While the whole health picture is more complex than eating an apple a day to keep the doctor away, fruits and vegetables undeniably supply nutrition vital for good health. Apples, whether whole or as applesauce, contain fiber and vitamin C. Applesauce naturally contains no fat and few calories per serving if you choose unsweetened varieties or make your own. Enjoy it by itself or substitute it for fats in baked goods to keep them tender. Use a calorie counter app when using applesauce in your recipes to track how many calories you're saving. A cup of unsweetened applesauce contains about 100 calories, yet feels substantial enough to act as a filling snack all by itself. Combined with a handful of almonds or a dollop of peanut butter, applesauce provides a balanced miniature meal rich in protein, carbohydrates and healthy fat. Like the apples it comes from, applesauce contains no fat. While most of applesauce's calories come from sugar, the sugar in question is naturally occurring fructose. Look for unsweetened varieties; sweetened applesauces can contain hefty doses of high-fructose corn syrup or sucrose. Both applesauce and apple juice possess similar calorie counts. However, because the applesauce also contains fiber in the form of pectin, it's the healthier option. Dietary fiber keeps your digestive system functioning regularly and supplies a more substantial snack for the same calorie cost. Fiber takes longer to digest and leaves your stomach more slowly; you not only feel fuller when you eat applesauce instead of drinking apple juice, you literally remain fuller. Incorporate a cup of applesauce with your lunches or add a spoonful of it to yogurt for dessert to boost the fiber content of your meals. 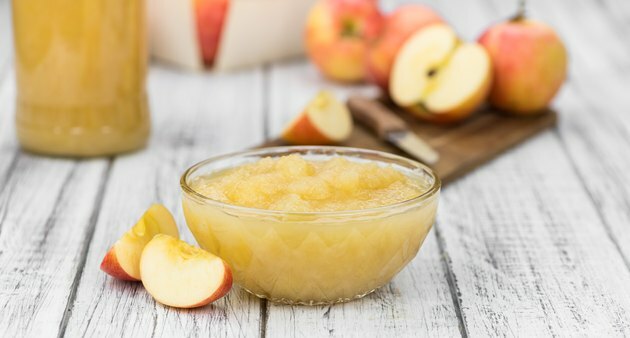 Citrus fruits have a deserved reputation for supplying plenty of vitamin C, but applesauce can supply as much as 80 percent of your daily vitamin C needs. Look for applesauce that contains added vitamin C. You might find it listed on the label as ascorbic acid, but the terms mean the same thing. Because ascorbic acid acts as a preservative as well as an important vitamin, manufacturers frequently add the ingredient to applesauce. If you make your own applesauce at home, it still contains vitamin C, but in smaller amounts. Applesauce by itself makes a delicious and wholesome sweet treat. As an ingredient, it also lightens the caloric density of baked goods and makes a delicious glaze for roasted meats. The University of Nebraska-Lincoln recommends swapping half of a recipe's margarine, butter, shortening or oil component with applesauce. The finished baked item will have a tender, crumbly texture and a slightly sweeter flavor, yet you'll reduce calories while adding fiber. Try applesauce as a glaze for grilled foods or poured over a pork roast.